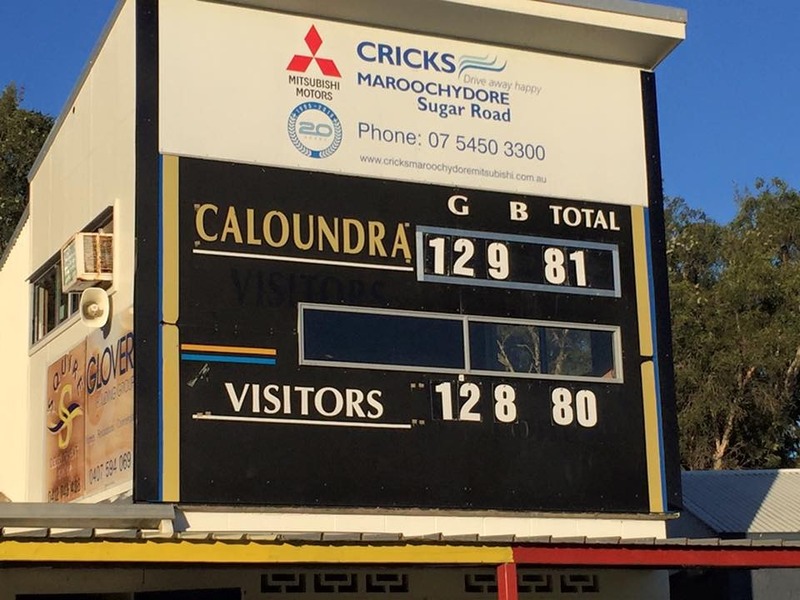 The match between Caloundra and Maroochydore was a hotly contested game with both sides fighting for the win right up to the final siren. 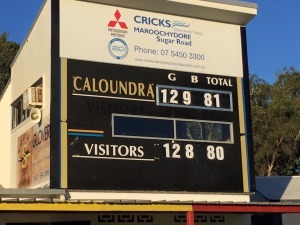 The lead changed at every break with Maroochy ahead at quarter and three quarter time while Caloundra fought back to lead at half time and then by the smallest of margins at the end. Both sides controlled the game are various times with stoppages and hard ball gets hotly contested, Tom Rudolph and Leigh Baker were excellent in both these areas. Best players were Chris Taylor, James Barnes, Josh Dennis, Leigh Baker, Tom Rudolph and Trent Flanders. Goal kickers were James Barnes 4, Trent Flanders 2, Chris Taylor 2, Tom Rudolph, Steele Hudson, Jesse Ferguson and Brendon Hole with 1 each. The team plays Aspley this week and poses to be a danger game with Aspley showing some great signs of improvement. AUSSIE RULES: Caloundra president Brad Hipwood thinks Panthers youngster James Barnes has what it takes to make it all the way to the AFL, after he starred in Caloundra's thrilling win over Maroochydore yesterday. The sharp-shooting forward slotted four goals as Caloundra (12.9.81) mounted a fourth quarter comeback to down the Roos (12.8.80). Scores were locked with just 30 seconds to go at North Rd when Maroochy rushed a behind at their own end to put the Panthers in front by one point. When the final siren sounded, Panthers fans had good reason to celebrate. "They (Maroochydore) are considered pretty much the biggest club on the Coast...we're not," Hipwood said. "It's always good to beat the big brother." About this time last year, Caloundra coach Russell Evans said he would've been happy just to get close to the Roos. Yesterday the lead changed hands at every break during the grinder and Caloundra took a 14-point deficit into the final quarter. In the end, it was strong performances from Barnes, Trent Flanders, Chris Taylor and Thomas Rudolph (best on ground) that sealed it for Caloundra. Hipwood heaped praise on Barnes, who played junior football with his son and Brisbane Lions recruit Eric Hipwood. "He's an extremely talented player and he's grown a lot taller in the last few years," Hipwood said. "I believe James can go to the highest level. With the improvement he's shown I truly believe he has the potential." With the club signing a new sponsorship deal with Cricks and fresh talent arriving to start the season, Hipwood said although he's not getting "carried away" just yet, things were looking good at the Panthers. "I think the difference between this time last year and now is our bottom six (in the side) are a lot stronger," he said. "No disrespect to the past players, we've just found that depth. Russell (Evans) has them playing a real desperate style of football. They never give up." In other matches yesterday, Noosa Tigers (17.21.123) went on a goal-scoring spree in the fourth quarter to down Moreton Bay (13.10.88) at Burpengary. In Brisbane, Mayne (15.12.102) thumped Aspley (9.10.64). Caloundra will face the Hornets next weekend, Maroochydore will host Moreton Bay and Noosa hosts Mayne.